I’ve taken a pretty long break from the blog, covering my busiest time of year at work (where did September go?) and a much needed vacation (where did October go?). During that time, cooking was either a chore or not an option. Thankfully, this has changed. After a trip to Spain, Morocco and Portugal, I am inspired to cook many new things. Travel inspires me to cook, for two main reasons. First, the obvious – I get inspired by things I’m eating and smelling, and it gives me the opportunity to explore the culture further after the trip has ended. The second reason I get inspired to cook is, unfortunately, bad touristy food and a lack of vegetables. Whatever the reason, I’m happy to be inspired to cook and blog! 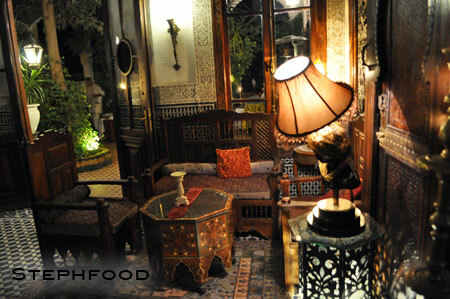 The riad in Fes: Don’t you just want to curl up with a glass of wine and some appetizers? Back to the Moroccan dip that inspired this post… We were brought to a guest house in the medina in Fes – a mind-boggling maze of a place. The setting was incredible and elaborate, and we were seated on the terrace, with a view of the city. The meal started with a series of cooked dips, which were lovely. I probably could have eaten a whole meal consisting only of dips. The eggplant dip was a highlight for me – cleaner tasting than babaghanoush (no creamy tahini here), and closer to Indian baingan bharta in texture. I had a thought – what if I served this dish hot? To make it more of a meal, I have added some green bell pepper and served it on top of rice. It could also be served with crusty bread instead of rice. This is a really easy dish – and you could even roast the eggplant and tomatoes in advance and cook the dish the next day to save time and make a weeknight-friendly meal. One thing I should note – I didn’t get a big enough eggplant, so it turned out a little more tomatoey than it should have. It still tasted amazing, but I recognize that the dip we had in Fes did not have such a strong tomato flavour. 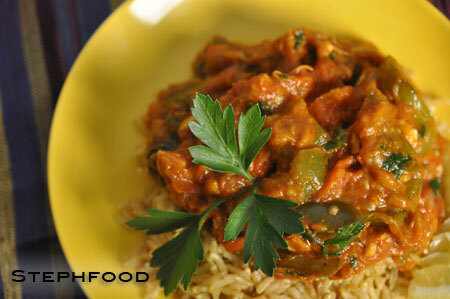 You can also be flexible with the seasoning, if you like it a little bit spicier or want to add in some Ras el Hanout. Cold, this is a great dip to bring to a party. Hot, it’s a simple dinner option. Based on this recipe. This can be served hot or cold. Traditionally, it is served cold (as a dip), but it made a great hot meal with the addition of green bell pepper and served with bread or rice. Place eggplant and tomatoes skin-side up, on an oiled roasting pan. Pierce the skins with the tines of a fork. Sprinkle a bit of olive oil on top of the eggplant and tomatoes. Roast in the oven, on the top rack, under the broiler until the skin is a little bit charred, and and the meat is very tender (it took about 10 minutes for me). While the vegetables are roasting – if you will be serving this as a hot meal – lightly sauté the bell pepper in a little bit of oil. Remove from heat, and set aside. Scoop out the roasted eggplant from the skin, and peel the skins off of the tomatoes. Mash the eggplant and tomato together. Set aside. In a deep sauté pan, heat the remainder of the olive oil over medium-high heat. Add the eggplant and tomato mixture, and stir. Add the remaining ingredients, except for the lemon. Mix well, cover and cook for about 20 minutes, until the mixture is very thick and most of the liquid has been cooked off. Do not let the mixture burn – turn down the heat, if necessary. Add the green bell peppers and half of the cilantro/parsley to the mixture and heat through. Add the lemon juice and the rest of the cilantro/parsley. 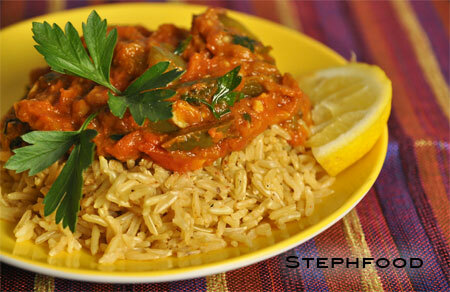 Serve warm or cold with crusty bread, or on top of rice.